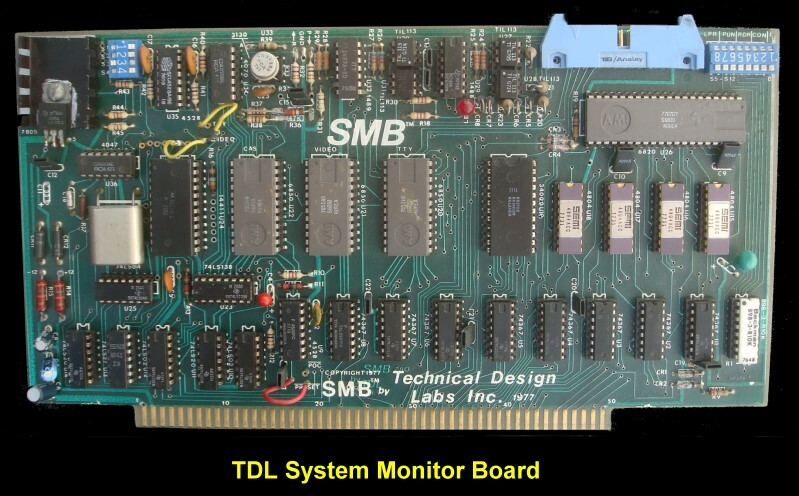 TDL System Monitor Board (SMB). This was an amazing card at at a time when a typical computer output went to a Teletype. A 2K MONITOR operating system (the ZAPPLE Monitor) in ROM.---2K of RAM, read/write storage for user programs, auxiliary monitor routines, and/or stack area. Two SERAL I/O PORTS, 110-9600 baud, RS232 or 20ma current loop for each port, and software-initialized via the monitor. Can be used for TTY, CRT terminal, or other serial device. One PARALLEL I/O PORT, bi-directional, can be configured as an input or output port port or dynamically changed under program control. A SENSE SWITCH INPUT PORT that allows the user to specify the I/O configuration which the system will initialize to. JUMP TO MONITOR, contains circuitry for automatically jumping to the monitor at F000H prompted by a power on clear (POC) and/or reset. 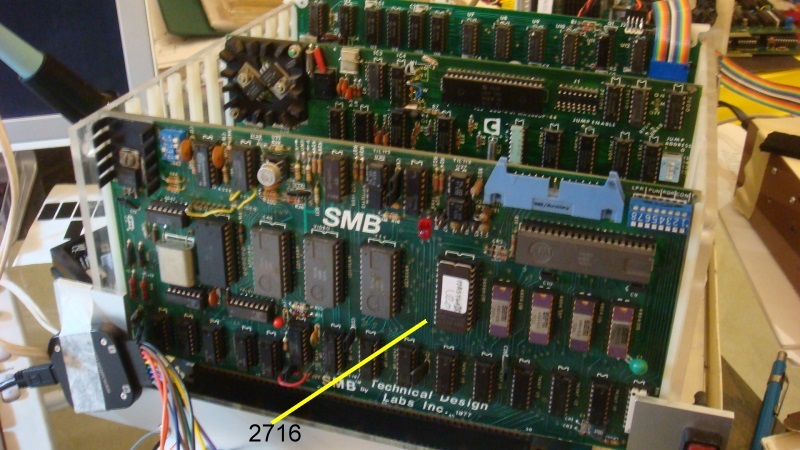 One problem TDL ran into with this board was that the four EMM-SEMI 4804 RAM chips shown above were at the time very hard to obtain because they were in short supply. 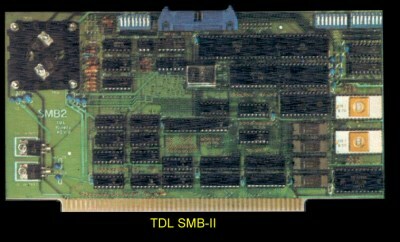 TDL supplied early users with a small adaptor board that contained Intel 2114 RAM chips. Such an adaptor board is shown below. The schematic can be seen here. There was a later second format of the (same) schematic which can be downloaded from here. TDL also provided good hardware updates. The relevant SMB ones can be seen here. The manual for the original Zapple monitor can be obtained here. If you examine carefully the custom Zapple ROM on this board you will see it's a 2K masked ROM, very similar to a 2716 except it has two *CS inputs. The second *CS is where Vpp is on a 2716. If you cut the traces to Vpp and CS* (pins 20 & 21), and pick off the combined two *CS signals from elsewhere on the board (by joining them to U10 pins 21 & 13) and ran the result through that spare NOR gate signal invert (U10 pin 14) to U19 (its CS*), and tie its pin 21 to +5 you should be able to use a standard 2716 EPROM. I think that is all that is required. This allows you to modify the Zapple monitor for your specific needs and yet maintain the functionality of the board. With just this board, a Z80 board and a video board you have the start of a very capable S-100 system. In the old days, I used this setup to test many of my other boards before putting them in my main system. Here is a picture of the test system. Later Version of the SMB. 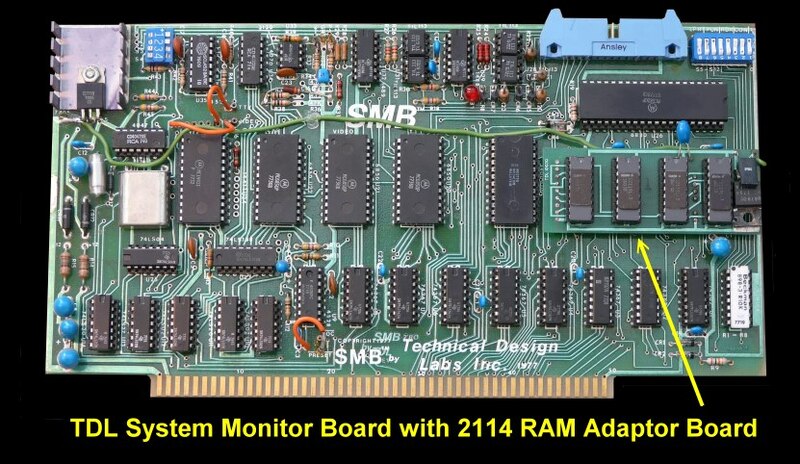 Apparently there also was a more updated version of the board called the SMB-II. It was advertised in Byte (~May 1979). But few were actually produced.